It’s been almost ten years since “Bicentennial Man” was released and we have yet to see a robot come even remotely close to Andrew Martin’s (Robin Williams) caliber. Of course “Bicentennial Man” is sci-fi but with all the advances in technology we know that the line between sci-fi and reality gets blurred more and more each day. 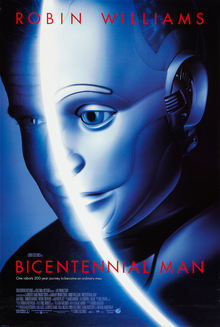 I felt like writing about “Bicentennial Man” though not because of the sci-fi element but because, having seen it again lately, I remembered just how much of a tearjerker the movie was, and still is. If you haven’t seen “Bicentennial Man” yet don’t expect to be surprised by an unexpected twist in the plot or a sci-fi film full of imagination that is truly out there but do expect to be do expect to be immersed in a story of a robot reaching for his destiny, which is to be recognized for his humanity.“Bicentennial Man” is a remarkable film not for its novelty but because it is a great example of good old storytelling. It is one truly compelling film. Other similar films that I enjoyed are “AI” and “I Robot”. For me AI was as good as tearjerker as “Bicentennial Man”. I think I almost died from a clogged nose right at the end when he “slept” with his mom. “I Robot” was also enjoyable with more action scenes and hence a bigger hit but for me it’s storytelling just wasn’t at par with the other two “humanized robot” stories. One of my all time favourite movie is Bicentennial Man, own it on DVD. Also so watch it every time its on TV.